Parfait is a wonderful thing. It allows those of us who find boredom in single-flavour desserts to enjoy many tastes and textures elegantly layered in one tall glass. This one was inspired by Japanese parfaits, in which the most peculiar colours and foods are combined to make insane edible creations. Avocado ice cream is among our favourite culinary discoveries of this summer. It seems as though avocado was created for ice cream making, with its smooth and creamy texture. 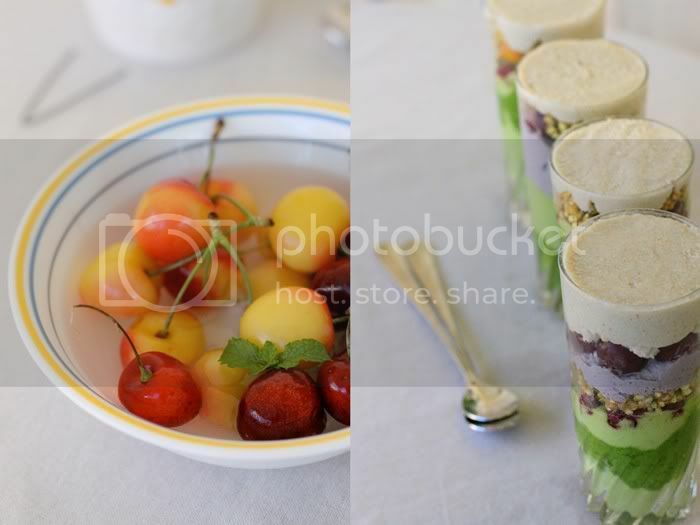 We wanted this parfait to tell a visual story and paint a delicious landscape. The layers of green ice cream, buckwheat crunchies, fresh cherries, and blueberry and vanilla creams are meant to resemble topography. Mountains and valleys, trees and flowers, and finally, at the very top – snowy peaks. 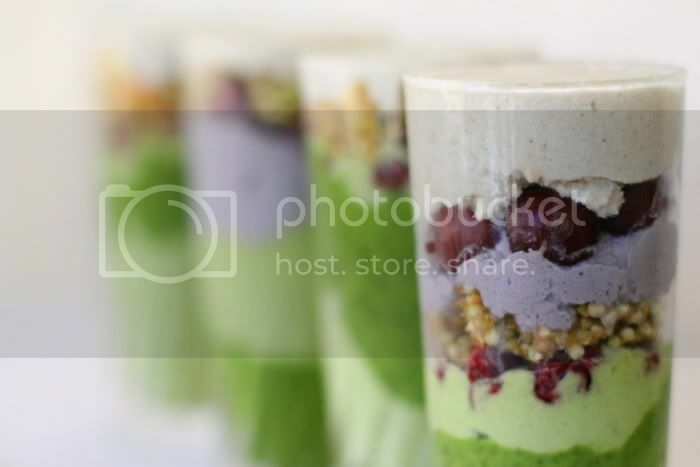 Just like all desserts on Golubka, this parfait is nourishing and full of ingredients that do nice things for your body. Go ahead, try it for breakfast. Combine all ingredients, except the lime zest, in a high speed blender until smooth. Reserve 1/3 of the mixture for the forest green layer. Chill well and put into an ice cream maker for 25 minutes or however long your brand of ice cream machine suggests. Add the lime zest directly into the ice cream machine after about 15 minutes of churning. Freeze for 1-2 hours before serving. If you don’t have an ice cream maker, there is an option to make avocado mousse instead of ice-cream. Just exclude the water and coconut meat/cashew, add about two more avocados and adjust the amount of agave to taste. Chill in the refrigerator until the mousse thickens. In a high speed blender, combine the reserved 1/3 of avocado mixture with some fresh spinach until the desired colour is achieved. Make ice cream according to the instructions above. Combine all the ingredients in a high speed blender until smooth. Reserve about 1/3 of the mixture for the Violet Layer. Chill in the refrigerator until the cream thickens. In a high speed blender, add fresh blueberries or blueberry powder to the reserved 1/3 of vanilla cream until the desired colour is reached. Chill in the refrigerator until the cream thickens. In a blender, puree the mango flesh and dates. Transfer to a mixing bowl together with the sprouted buckwheat and mix well to coat the sprouts. Spread on Teflex sheets and dehydrate overnight or until completely dry and crispy. Cut the fresh cherries in half. Optionally, dehydrate the fresh cherries at 115F for 1-2 hours. Using a piping or Ziploc bag, squeeze some avocado ice cream into a tall glass to make a first layer. 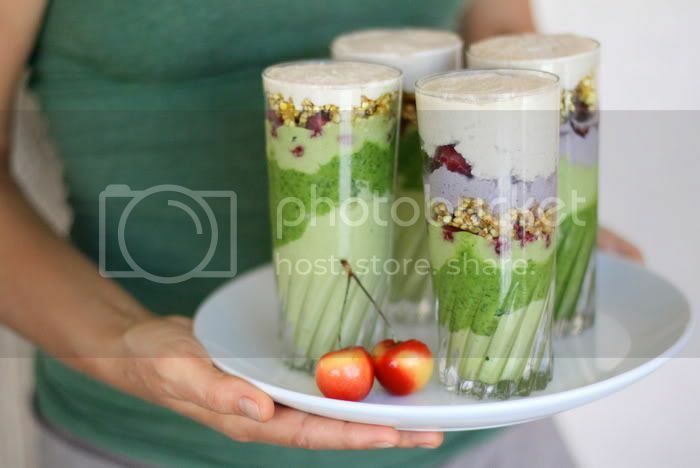 Follow by the forest green layer, and then more avocado ice cream mixed with cherries. Sprinkle with mango buckwheat crunchies and top with blueberry and vanilla cream. You can arrange the layers in any way you want. Aesthetically, it’s nice to take care to arrange the layers unevenly to create the hilly landscape appearance. I love that you made it into hills and mountains and clouds, awesome! I’m going to have to make avocado ice cream soon. Your creativity and talent are just amazing! OMG!!!! It looks amazing!!!!!! Please, next time you make it invite me :)) I’ll pay for this!!!!!! The most incredible looking and sounding parfait ever created. I could eat this morning, noon and night 365 days a year. Great work! I HAVE BEEN TREATED WITH THOSE! YOUR GRAT WORK IS REALLY APPRICIATED! OMG! Can you send me two please? wow the colours are beautiful!! I just saw this on F.G.-amazing! So beautiful I’d feel bad eating it, but I still would…! I have never seen anything like that, it looks absolutely amazing! Wow, what a gorgeous parfait! And it has spinach! Crazy! I love the idea of making the food into art by creating the topography, gorgeous! Jacqui: We had the landscape idea and just had to make this :) Hope you like the ice cream when you get a chance to make it. Nataliya: So happy you liked it! David: Thanks so much! Check out some Japanese parfaits, they are all insanely cool. Elizabeth: Thank you! I promise you can’t taste the spinach once it’s been blended and frozen, but the nutritional value is all there! Susanna: Thanks so so much! 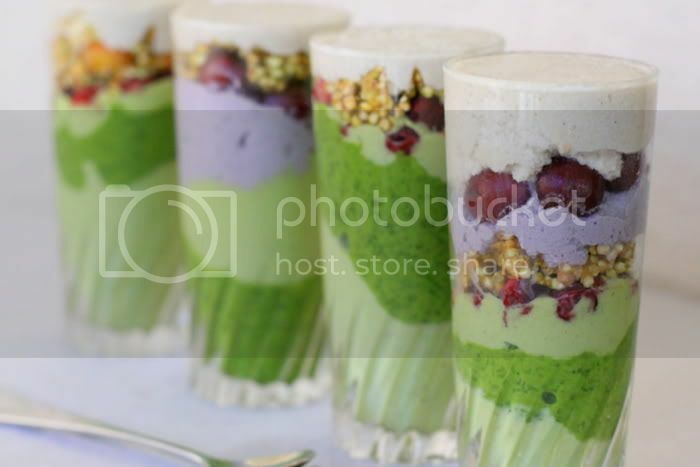 Love the color of those parfaits – beautiful! Hi, I found you on Tastespotting and just had to comment. 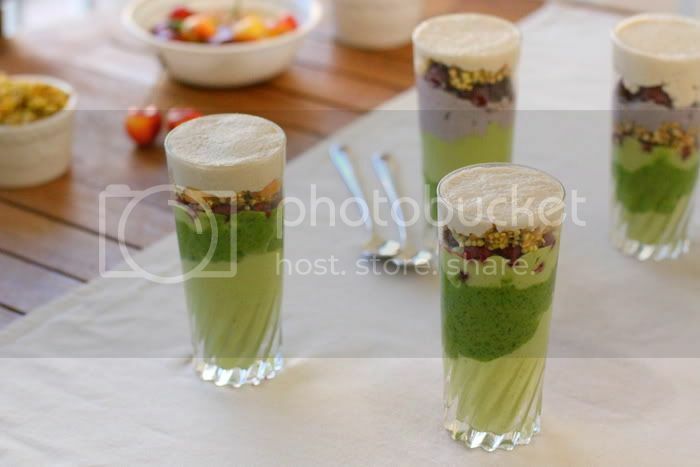 These parfaits are absolutely beautiful, wow! They look perfect! Love the idea, beautiful colours, wonderful photos as always! Those are breathtaking!! You are so creative. I love that you have buckwheat krispies in there, I eat them everyday but I make mine just plain. Just sprouted buckwheat that has been dehydrated. Peace and Raw Health to You!! Paula: Thank you, so happy that you’re inspired. Jean: Thanks for your comment and kind words! Elizabeth: Thanks! We make plain crispies too and add them to salads and morning fruit. Ricki: Thanks very much! Making them was tons of fun. First time visiting. Very beautiful colors, amazing and the recipes look so delicious. Nice blog. holy heavens. what a BEAUTIFUL and delicious little dessert! I like your style. I always, ALWAYS love a recipe where I can replace coconut meat with cashews!! Opening a young coconut freaks me out!! This is my first visit here and I love it! Absolutely beautiful. In the words of The Terminator, “I’ll be back”. This is an amazing dessert for us vegans! I know fresh is best but what is the longest you could keep each layer sperarately in the firdge for?